I was super excited! It was going to be a 2-week long trip in Turkey, starting from Istanbul. Not many would be aware that Istanbul or Constantinopole of ancient times, is a city on two continents - one part in Asia (known locally as Anatolia) and other part in Europe. 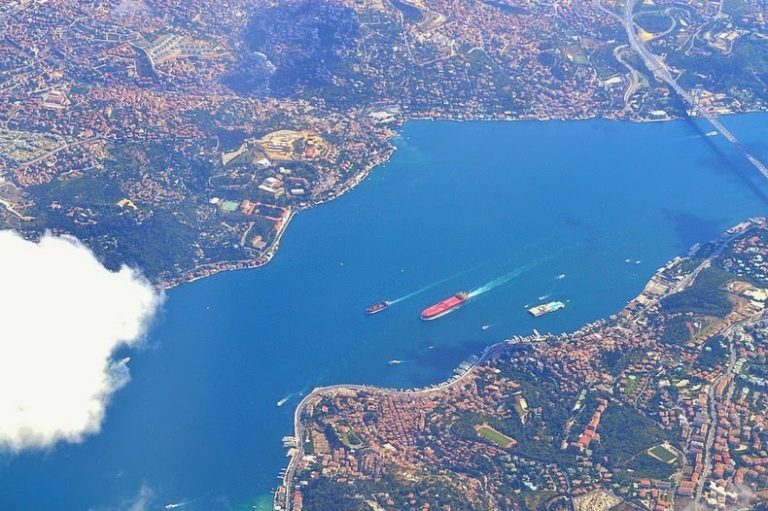 The Bosphorus Strait runs across the city dividing it into continents and connects the Black Sea to the Marmara Sea. The Strait has been a site of significant settlement and civilisation since ancient times. It was here, on the European side of the Bosphorus, the Greeks founded the city of Byzantium, which later came to be known as Istanbul. We landed at the airport and hired a cab to our hotel near Sultanahmet square. We were waiting for the cab when a German backpacker student approached us and asked if we would be willing to share a cab with her. Of course, we agreed and started off towards the city (50 TL per person). It took us a good two hours to make our way to our hotel. The sights and sounds as we neared the city, felt familiar - the chaos on the road, traffic jams, ladies and children [most of them were the displaced Syrian refugees :( ] selling trinkets on the street and lots and lots of crowds everywhere. The driver took upon himself to show us his beautiful city as we rode by. The traffic was heavy as we passed along the Bosphorus Strait, but the sights were stunning. The air travel, and the cab ride had drained us out for the day. It was almost 6 pm in the evening when we checked in to our hotel. It was a cold and windy day and the weather was unusually cold at 6 degrees Celcius for that time of the year. We wrapped ourselves in jackets and headed out to explore the neighbourhood and grab some food. We still had to plan our 3-day stay in Istanbul. Our hotel owner was a friendly and helpful guy. He made us feel comfortable with all the little tips and pointers one needs to get around a new city in a new country. Not only he helped us book our Istanbul tours but he also helped us in booking the Cappadocia and Izmir tours! We decided to take the Bosphorus Strait Tour early in the morning the next day. We were picked up at our hotel in a bus and dropped near the ferry point.<span class="Apple-converted-space"> We were a group of around 12-15 people, all excited to start the tour. </span>I was wondering how will I brave the biting cold on the open deck of the cruise. Hubby was insistent that we be on the open deck on the top floor to enjoy the view rather than be in the cosy warmth of the covered lower deck. I agreed. 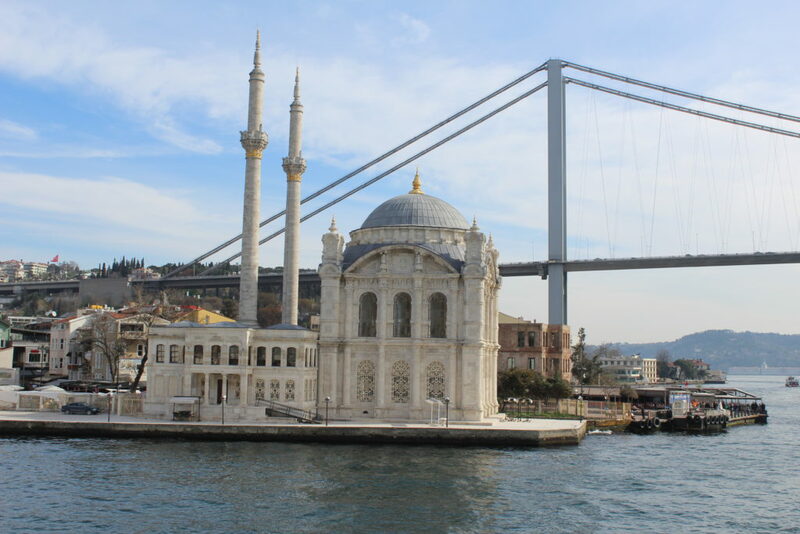 Our first halt was at the Ortakoy mosque, one of the most famous locations on the Bosphorus. It is a picturesque mosque with the Bosphorus bridge in the background. We stopped here for about 40 minutes and got ample of time to see the mosque and get some shopping done as well. 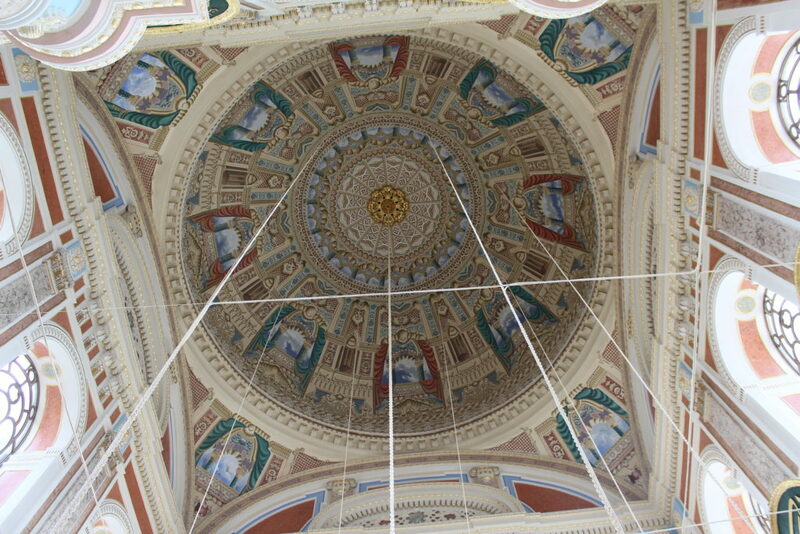 The mosque is very pretty as you see in the pics below with beautiful in-laid tiles and decorated ceilings. The area near the mosque is lined with roadside shops selling knick knacks and other items. We were lucky to find some beautifully embroidered table cloths at a steal deal and a pair of gloves to help me beat the chill. The Bosphorus bridge joins the Asian side with the European side of the city. As we ferried on, we passed under the bridge to reach the Kucuksu Pavilion. This was the Sultan’s guesthouse during his frequent hunting expeditions and is now turned into a museum. 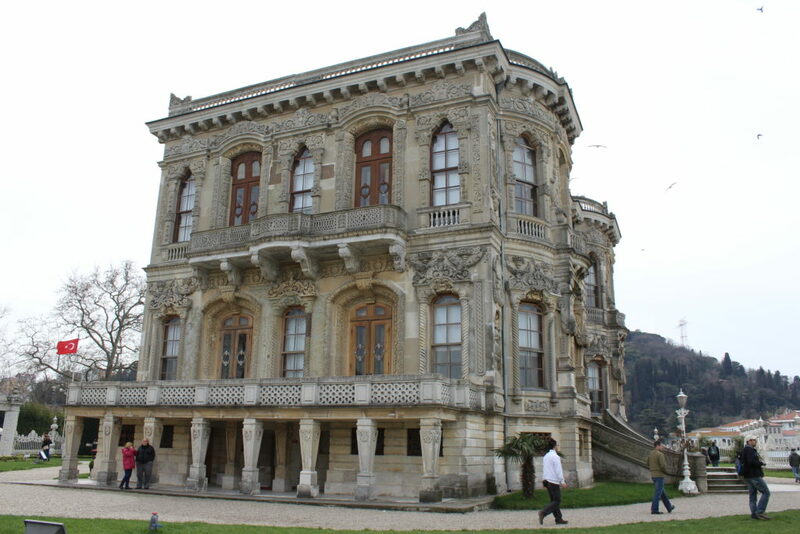 It is a beautiful palace with intricate engravings and other motifs adorning the walls. We spent around an hour at this place clicking away to glory. Back on the ferry, we were treated to some delectable cookies and a sweet sherbet. Munching on the food, we were drinking in the beauty of the stunning views of the city. Our next stop was the Rumesli fortress built by the Ottoman king, Sultan Mehmed-II. We were told that the fortress was constructed at the narrowest point of the Bosphorus strait, opposite an Anatolian Castle on the other side. These two vantage points served to protect the city from invaders via the Strait and also to prevent any aid from the Black Sea to reach the city during its Turkish seige. Interestingly, this fortress, was built in a very short span of 4 months and 16 days to help the conquest of the city from the Byzantines. We clicked a lot of random pictures while listening to our guide narrating us the history of the place. The view of the Bosphorus strait from the top of the fortress was amazing! 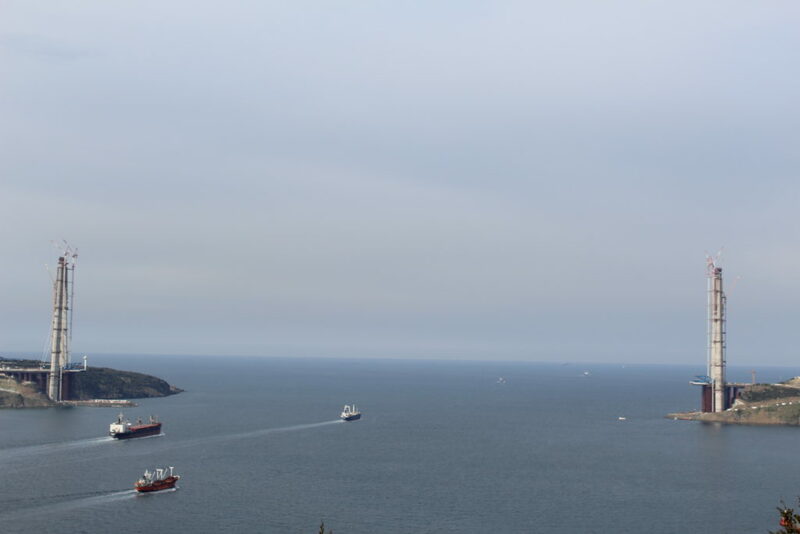 We hurried back down so as to not miss seeing the gigantic chains, which run between Rumeli fortress and the Anatolian Castle on the other side. These were again used to safeguard the city by preventing the enemy ships from crossing the narrow strait. The highlight of our cruise though, was the yummy lunch they served us on the the ferry. Inspite of being a vegetarian, my options were not limited and I was served a delicious spread of close to 8-10 cold </span>Turkish mezes and soft drinks. I loved the mezes so much that I ended up asking the guide about its recipes and was not surprised that a lot of effort of pounding and grinding the spices, lent the dishes its delicious flavours. After lunch, we started cruising again towards the Black Sea. Our last stop was at the fishing village of Anadolu Kavagi. It is a typical fishing village dotted with fish-n-chips shops, not far from the mouth of the Black Sea. There were ruins of a castle up a nearby hill, which we intended to see. The view from the top was quite raved about. The walk to the castle was quite steep and it took us around 20-25 minutes to get there. The castle had a lovely restaurant overlooking the Black Sea. 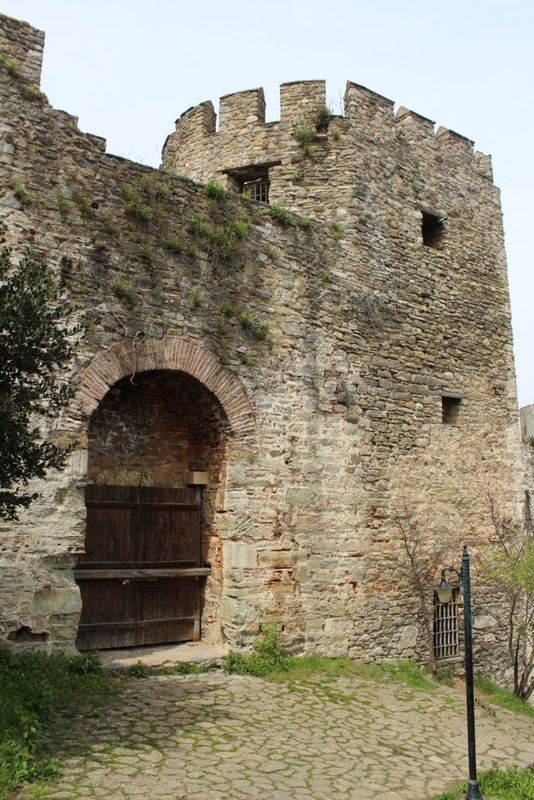 There was nothing much remaining of the castle except its walls. However, we soaked ourselves in the vastness of the Black Sea spread out there to our heart's content! It feels amazing to experience the history and culture of a foreign city in such a wonderful way. On the way down, we saw a local lady in a lovely local attire, swirling something like a pizza base in her hands. On getting closer, I saw that it was a small kiosk selling something very similar to aloo parathas – Gozleme Patate. She had small bowls filled with mashed potatoes, &amp; cheese and was expertly making those Gozlemes by making them fly like saucers. All the trek up and down the castle had whetted our appetites and we ordered one plate of those steaming hot parathas (Gozlemes ;)) We relished every bit of it along with the mesmerising views that the castle offered us. The new culture, new cuisine, ever-sociable Turks and the new sights made our trip a truly memorable one. Back on the ferry, I convinced my hubby to sit on the lower deck ensconced in the warmth of the cabin. We reached our drop-off point in around 45 minutes bidding adieu to the wonderful Bosphorus!